In appreciation for the commitment our men and women serving in the Canadian armed forces, BMW Motorrad Canada is pleased to announce a special motorcycle purchase program for all active members of the Canadian Armed Forces, to enable them to purchase the BMW motorcycle of their choice for personal use. Eligible Customers: Members include active duty in any branch of the Canadian Armed Forces and Veterans with a valid military identification card. In appreciation for the commitment our men and women providing emergency services to our communities, BMW Motorrad Canada is pleased to announce a special motorcycle purchase program for all active Emergency Services members to enable them to purchase the BMW motorcycle of their choice for personal use. Eligible Customers: An Emergency Services employee must be employed at a recognized Public Authority at the time of the motorcycle delivery. A Public Authority is considered to be a Federal, Provincial or Local Police Agency / Authority, Fire Department / Emergency Medical Technician (including both paid & active volunteer) and Diplomats. We are pleased to support the motorcycle rider training community by offering allowances based on the purchase of a new BMW Motorcycle in 2018 by a documented rider training instructor or other documented riding school instructor. We are pleased to offer members of the BMW Clubs Canada an opportunity to continue growing their connection with the brand while having some fun with special purchase support for a new BMW motorcycle. We very much appreciate the loyalty these customers have for us and look forward to a relationship lasting many years. 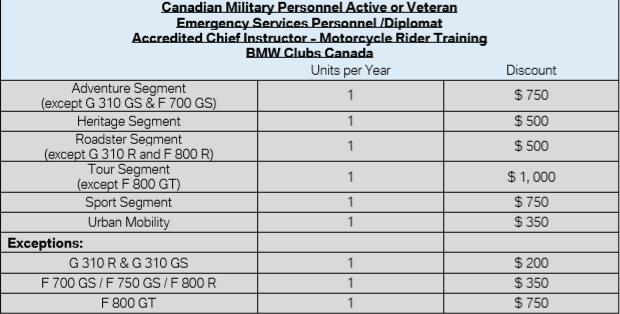 Eligible Customers: Active BMW Clubs Canada members who have been members one year or longer at the time of their motorcycle delivery will be eligible for this program. List of approved BMW Clubs Canada can be find on http://bmwclub.ca/member/motorcycleclubs/ .